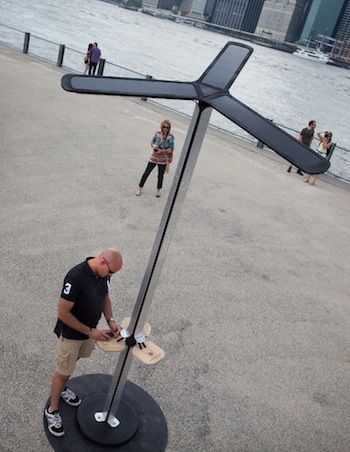 Solar-powered charging stations open to the public will begin appearing in the New York City area, thanks to a partnership between AT&T, Pensa and Goal Zero. “We view this as a commitment to being a part of the New York community as a corporate citizen but also as a way for New Yorkers to continue to engage with their technology as they continue to consume more and more data,” said Marissa Shorenstein, president of AT&T’s New York division. The spark for the project came after Hurricane Sandy, when AT&T supplied diesel generators and cell towers on wheels to hard-hit neighborhoods in the five boroughs. Working with Goal Zero, which makes portable solar chargers, and Pensa, which had been experimenting with creating stationary street chargers, the company won approval this spring from city Parks Department officials to test them. They will rotate locations — including Orchard Beach in the Bronx, Governors Island, Pier 59 in Hudson River Park, Coney Island, the Staten Island Zoo and several cultural events. Via The New York Times; and don't miss the 24 cool inventions from David Brin's Earth. See also Pensa and Goal Zero.